The authors examine the dependence between reaction time as an indicator of change at cerebral level and H-reflex amplitude change being a relative index of excitability level in the spinal cord during the preparation of a simple voluntary movement in thyrotoxicosis patients. Electrophysiological investigations are carried out after identifying the disease and prior to the beginning of causal therapy. Patients are comfortably seated on a chair in a dark room and respond to light signal from a blitz-lamp and it was determined reaction time. Simultaneously with light signal presentation, nervus tibialis in the popliteal fossa of the same leg is excited to evoke H-reflex. One-day signal programme consists of a total of 120 light signals divided into three equal blocks. H-reflex amplitude evoked only once for every light signal is compared with control H-reflex amplitude. Its decrease or increase is read. Reaction times are grouped according to the extern of corresponding H-reflex amplitude increase or decrease. Data obtained serve to construct relation curve between reaction time and H-reflex amplitude changes. This relation curve differs in nature from the curve when healthy subjects under the same experimental conditions are tested. Key words: reaction time, H-reflex amplitude change, thyrotoxicosis, voluntary movement. Marinov M, Marinova I, Mirchev K, Boychev B, Romanova Ch, Radeva N, Radev RZ. Relationship between reaction time and amplitude changes of the H-reflex in the performance of simple motor task in patients with thyrotoxicosis. J of IMAB. 2013; 19(1):379-381. 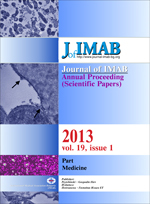 DOI: 10.5272/jimab.2013191.379. 1. Granit R. The Basis of Motor Control. London: Academic Press. 1970. 2. Sherrington CS. The integrative action of the nervous system. New York: Arno Press. 1973. 3. Gurfinkel VS, Palcev EI. The influence of the state of the segmental apparatus of the spinal cord to the implementation of a simple motor response. AS USSR. 1965; 10 (5): 855-859. [In Russian]. 4. Gurfinkel VS, Kotz JM, Krinskii VI, Palcev EI, Feldman AG, Tzejtlin ML et al. On the set before the movement. In: Models of structural-functional organization of certain biological systems. Moskva: Nauka. 1966. pp. 292-301. [In Russian]. 5. Kotz JM. Organization of voluntary movement. Moskva: Nauka. 1975. [In Russian]. 6. Gurfinkel VS, Levik US. The central programs and a variety of movements. In: Management movements. Mitkin AA, Pika G. eds. Moskva: Nauka. 1990. pp. 32-41. [In Russian]. 7. Requin J. Some data on neurophysiological processes involved in the preparatory motor activity to reaction time performance. Acta Psychol (Amst). 1969; 30: 358-367. [PubMed]. 8. Lanska DJ. Chapter 33: the history of movement disorders. Handb Clin Neurol. 2010; 95:501-546. [PubMed]. 9. Tzekov Tz, Gerilovski L. Relationship between the amplitude of the H-reflex of muscle agonists and latency of motor response in terms of simple movement situation. V Sci session of MF. Varna 1974. pp. 72-75. [In Bulgarian]. 10. Tzekov TzT. Relationship between reaction time and spinal changes in preparation for voluntary movement. Ph.D. dissertation. 1975. [In Bulgarian]. 12. Zefirova GS, Mahneva IM, Kochergina II, Plevako VA. Apatetic form of hyperthyroidism. Klin medicina. 1998; №7: 48-49. [In Russian]. 17. Person RS. Some modern way of an analytical study of human neuromotor apparatus. Fiziol cheloveka. 1982; 8 (6): 1018-1033. [In Russian]. 18. Gurfinkel VS, Kotz JM. Shik ML. Regulation of human posture. Moskva: Nauka. 1965. [In Russian]. 19. Gurfinkel VS, Kotz JM. Motor presetting in humans. In: Neural mechanisms of motor activity. Moskva: Nauka. 1966. pp. 158-165. [In Russian]. 22. Pollard JD. Neuropathy in diseases of the thyroid and pituitary glands. In: Peripheral neuropathy. Dyck PJ, Thomas PK. eds. New York NY: Oxford University Press. 2005: pp. 2039-2042. 24. Hallett M, Tandon D, Berardelli A. Treatment of peripheral neuropathies. J Neurol Neurosurg Psychiatry. 1985 Dec;48(12):1193-1207. [PubMed].